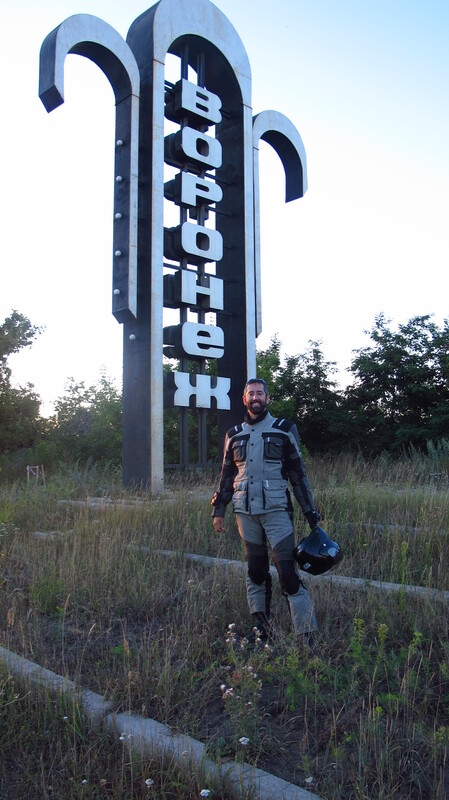 Ivan had told me that the road north to Voronezh was really bad, so it was better to head west and meet the M4, the motorway connecting Moscow to the coast. I took his advice and set off later than I wanted, at about 11, but he was such a nice guy that it was hard to leave… we just kept talking and talking over a delicious breakfast. I rode west for about 350km, the GPS refusing to give me a route to Voronezh, so I thought I would try to reprogram it once I got to the M4. About 80 km from there, though, it just froze, and no matter how many times I restarted it, it refused to show me a map or accept a destination. I stopped to see if I could fix it somehow and to put the waterproof layers on the jacket, as it was getting very cloudy, but I did not manage to get the GPS to work. Quite annoyed, I rode on and it started to pour down. I had thought it would not be very bad, so I had not put the waterproof layer on the trousers, but it was raining hard and it was darker ahead. I was also running out of petrol, so I just stopped at the first petrol station I found and put on the layer. It was already 4 pm, and when I asked the lady there how far it was to Voronezh she said 700km. My heart sank. There was no way I could make it today, but I had made a reservation in a hostel Ivan had recommended, and it was already paid for. With no GPS and no idea how the road ahead would be, I just thought I would ride on and stop for the night in the first motel I found. I looked for accommodation on the GPS and surprise, it worked. It gave me a hostel on the M4, the road I was looking for, and it was not far. Once I found the M4, it turned out to be a dual carriageway, not in great condition, but it enabled me to travel a bit faster, at least. It stopped raining and the sun came up, so my spirits lifted again. I decided to keep going as far as I could and then find another place to spend the night. Soon, I saw a sign that read 440km to Voronezh. I was doing 120-130km/h, so it was doable. I decided to try and get there before nighttime. However, a few kilometers down the road, the dual carriageway vanished, and I run into a nightmare of traffic jam and roadworks. I could not believe that a main road leading to the capital was a crappy two-lane road going through every single village and town on the way. I was already starting to regret having made the decision to take the detour to find the M4, even if the road was bad from Volgograd, at least there would have been no traffic jams and I would have saved almost 400km. A while later though, things changed again. The road went back to a dual carriageway and the GPS miraculously started working again. I think it had been having trouble with the bit that was under construction. It now estimated that I could get there at 10pm, which was not bad. I pushed on and a while later I saw a motorbike coming up behind me. It was a white KTM on Russian plates, and after a while of riding together, the guy signaled to stop at a petro station. I pulled in with him and went over to say hi. He spoke very little English, and told the best he could that he was from Moscow and heading back home. I told him that I was going there too, and spending the night in Voronezh, so he decided to come with me, as he was not going to get home that night. The road was better and he rode quite fast, riding on the hard shoulder or on the oncoming lane when there were traffic jams, so I thought ‘when in Rome, do as Romans do’, and followed him. We got to the hostel half an hour later, at half past nine, and I was very happy to have a shower and some dinner. While we were eating, he told me that he was leaving at 4 am the following morning, as he had to be back at work by 9. I was staying for an extra day to have time to catch up with the posts, so he gave me his address and told me that I was going to stay at his place in Moscow and that he would show me around the city. Russian hospitality is amazing! I agreed to meet him in Moscow on Tuesday and went to bed early. 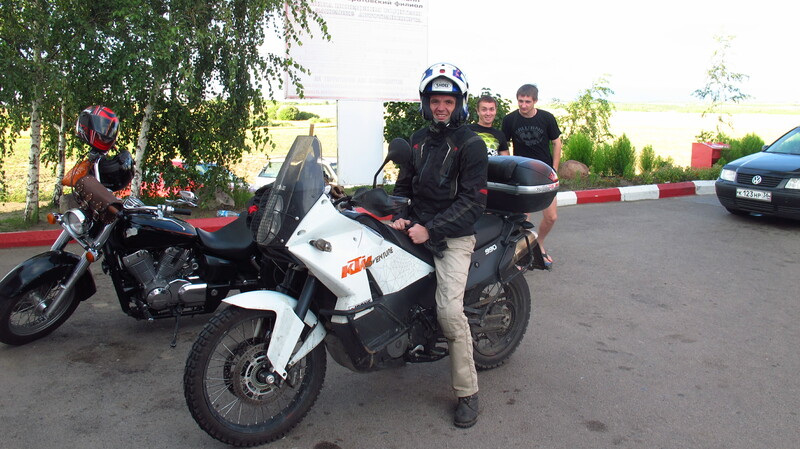 This entry was posted in Stroming The World 2013, Travel and tagged hostel, KTM, Voronezh by Kilian. Bookmark the permalink.